As the 49ers continue to pursue their preferred Santa Clara site, the Raiders have been focusing mainly on the Coliseum, despite their brief (and largely fruitless) discussions with Dublin officials. Regardless of what anyone thinks of the Coliseum deal, Al Davis, or the politicians involved, the Coliseum remains the most feasible place for the Raiders to get any kind of stadium deal done. Here’s why. LA can’t get it together. Numerous groups with billionaires at their respective helms have cropped up from time to time to declare their viability for an LA expansion franchise. Often their talk would result in further discussions with LA pols, which would result in nothing. At times there would be two groups competing simultaneously. Multiple sites would come up as well, all of which would end up dead thanks to cost or pre-existing political conditions. While the NFL would love to place a team in LA, there’s no indication they’d be willing to foot the bill any higher than what was required to get the NY Giants/Jets stadium going. That would leave any LA stadium woefully short of any real cost. At the same time, any team that wanted to move to LA would need the league’s financial assistance, forcing such a team to bow to the league’s desires. Right now the league is perfectly fine with the increased TV revenues they get from a blackout-free market such as LA. Al Davis ain’t selling or dying anytime soon. Davis has proven to be the NFL’s version of Rasputin. He has survived legal battles. He has outlived nice guy owners such as Lamar Hunt, Wellington Mara, and Jack Kent Cooke. He continues to command from his throne, as evidenced by the current controversy involving head coach Lane Kiffin. He may be showing Nero-like tendencies, but like it or not, he’s still there. A refurbished Coliseum is far cheaper than a new stadium. The Mount Davis addition and additional renovations, which included the Westside Club and a new baseball/football press box and all new seats, cost $120-140 million depending on who you ask. 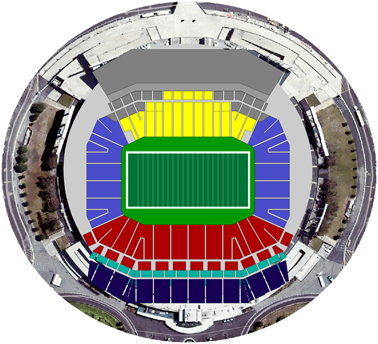 New NFL stadia being planned or under construction have price tags of $800 million at the very minimum. No renovation plan should have a cost more than half that. Renovation has many advantages that stem from cost. The site, once the original bowl is demolished, is already excavated and ready to build. New piles may have to be driven because the new western structure would be far taller and more complex than the old bowl. It would likely mimic Mt. Davis to an extent, though it would also include team facilities such as locker rooms and offices, a new press box, and an even more lavish club facility. 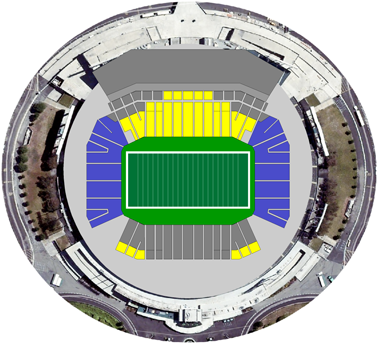 The end zones would have limited seating, reducing the stadium’s footprint. The new structure would look similar to Heinz Field in Pittsburgh. The overlay above keeps the old Coliseum structure to show how odd the sightlines are for football from the old bowl. The only advantage it has over any new stadium its low profile. The design could eventually evolve into something more like what the 49ers are proposing, though having nearly 100 suites in the eastern section defeats the purpose. It’s hard to say how long it would take to build. Certainly not three or four years as new stadia typically take. Not 10 months as what happened with Stanford Stadium. Probably 24 months thanks to the site’s readiness. Process should be quicker too because any EIR work would reflect the same use as the previous structure. That hidden process time and cost cannot be underestimated. It would be difficult to conceive of the Raiders playing in the Coliseum in the interim. Demolishing the old bowl while leaving Mt. Davis intact would leave only 22,000 seats in place, and to make construction faster builders couldn’t be interrupted by the occasional game or other events. It was doable for the 1995 construction, but not for a project this massive. The Raiders won’t be welcome at an old or rebuilt Memorial Stadium on the UC Campus. No chance of playing at Stanford Stadium, and Spartan Stadium’s far too small. So are the area ballparks. That leaves Candlestick as the only venue large enough to hold the Raiders. Sounds blasphemous to be sure, but as both the 49ers and Raiders move forward with their plans, they may find themselves in the unusual position of needing each other. The Santa Clara site has at best a 50/50 shot since it will likely need a true citizens’ vote in November, not an “advisory” vote that the 49ers were gunning for. Should that proposal lose, the team would be forced back to SF, only to face a city that has no public funds to pledge for a new stadium. Meanwhile, the NFL will at some point tire of California’s inability to get a new stadium built anywhere in the state. Unlike the situation in LA, it can’t allow another exodus of teams because there aren’t new stadia in other markets just waiting for football teams to move there. It can help the teams’ relative plights by encouraging both teams to work together and by pledging a junior version of the Meadowlands plan for a renovated Coliseum. It’s a proposal that won’t tax the other 30 owners much, and it would allow the league to focus its resources on the remaining three potentially itinerant teams, the Chargers, Vikings, and Bills. From a local practical standpoint, both teams would have a far easier way to pay off the requisite bonds since both teams’ stadium revenues would contribute. There is, of course, a matter of pride. Both teams and their fans would have to come to grips with major territorial issues. The Raiders would have to deal with playing in the ‘Stick temporarily, while the 49ers would deal with a far more permanent transition. That said, there is a point where pride has to give way to more practical concerns. Those who really want to see their teams stay in the area in the most financially responsible manner should consider such a plan.